Every good project has a color palette. Whether it is a website, banner or print ad, choosing the right colors can mean the difference between making an impact and being ignored. That’s where Color Schemer Studio 2 comes in. When you are done, simply drag the colors to “Your Favorites” and export your palette as an HTML Color Chart, CSS Style Sheet, GIF/PNG swatch and even an Adobe ACO. You also create a handy print guide for project documentation. The new Studio 2 now supports both RGB and CMYK and converts from one to the other. You can even test your palette for different degrees of color blindness. But, that’s just the starting point. There are so many new tools. The new LiveScheme tool allows you pull, drag and twist across the color spectrum to find the right colors. The new Variations grid turns any starting color into a mosaic based on hue brightness, saturation or related colors. Suppose you are working on an ad or cover featuring a large photo background, and you want all type to reflect the photo’s color palette. The built-in PhotoSchemer makes it easy. Simply import the image and click around the photo. Or, let PhotoSchemer find the palette for you. Once you have your colors, you still have all the other tools in ColorSchemer to explore or expand your choices. 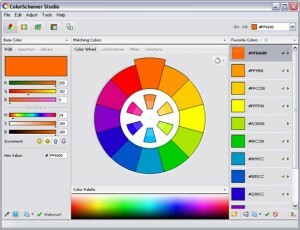 ColorSchemer is supported online by official forums and blogs. There are also plenty of “Fresh” schemes for inspiration. The website offers a fully-functional 15-day Trial version. But, at under $50, it is a purchase that will pay for itself in the time it saves with your first project. BONUS — ColorSchemer also offers a FREE ColorPix/Galleria Widget to pick any color from your desktop or any active window. ColorPix automatically displays any screen color into RGB, HEX, HSB and CMYK. You can even use the built-in magnifier to easily identify colors on a pixel by pixel basis. ← Previous Previous post: NAPP – more than just a magazine! Next → Next post: Looking for new fonts?